Glide through the capital with the fastest and most frequent fleet on the river. Single tickets are perfect to get from A to B in style. - All piers are wheelchair accessible except London Bridge City, Wandsworth Riverside Quarter and Cadogan piers. Ramps are used for boarding. MBNA Thames Clippers, the fastest and most frequent fleet of catamarans on the River Thames, has more than 15 vessels and stops at 21 piers across London. It is the best way to enjoy the city's landmarks! Customers can enjoy the fantastic views from the climate controlled indoor cabins or from the outdoor back decks. The vessels all have licenced coffee bars on board. With in:flow you can turn your phone into your audio guide! Using GPS, the app follows your route and gives you: River facts, stories about the Thames and iconic London sights. 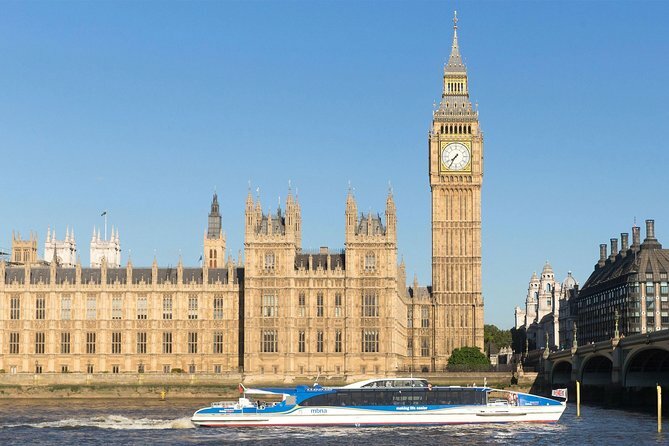 It is available to download FREE on App Store and Google Play, simply visit www.thamesclippers.com/visitorapp on your mobile.